Good breakdown but Belichick (somewhat) had that play scouted from the jump -- expected a run through A gap but also had B covered as well (this is heavily reliant on Roberts who has one on one coverage with Howard). Notice how Hightower and the lineman shift (not shown in your video) from a over to an under front despite not seeing any inside pre-snap motion and how Hightower didn't even budge after the snap, indicating they were not even expecting a PA either. Pre-shift you have Roberts lined up over top of the 0, Hightower lined up above the 3B gap, Flowers at the 5, and Brown at the 1. After which you have Roberts taking a one step move into the 1(in place of Brown), Brown taking 1 step inside to move into the 0, Flowers moves into the 3 gap, and Hightower takes over for Flowers at the 5. At this point, if you pause your video at 3:10, you will see now they have a more favorable 4 vs 3 match-up covering both the A and B gaps. The thing that will be frustrating is that there is supposed to be nobody better than Heistand to teach these fundamentals and then more advanced scheme blocking. I respectfully disagree. I cut the shift because it didn't matter. Sims is probably cutting the BS EMLOS regardless without the shift, but you can block it the way you have shown with him leading as well. That is a different play though. Either way it doesn't matter. Once TE pulls that play is going backside by design because there is no one to block 23. It should have and could have worked against either front. 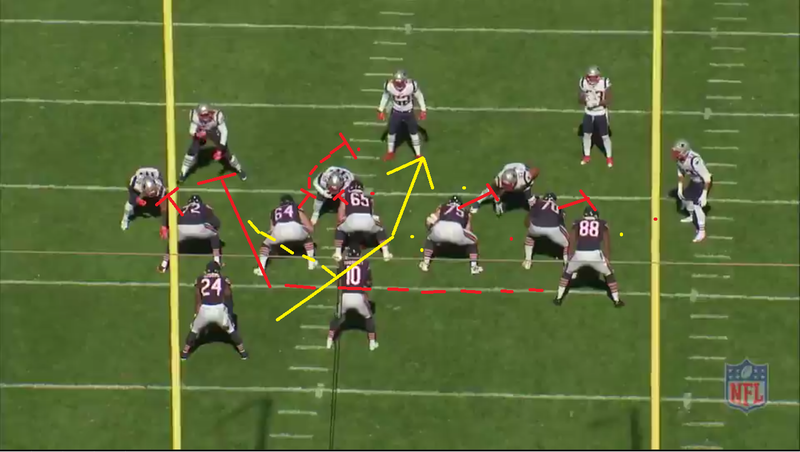 But once they shifted it made it tens times easier because it gave the Oline huge advantage in angles on the backside. Play should have worked gang busters. It was a great call. They shifted to pre snap strength and Bears were going backside. Belichick was one who was wrong. Howard should have pressed strongside hole more to make Hightower move a little more, but at least he froze him. It didn't work mainly because Leno blocked it like (pre snap) strongside IZ which is what defense was expecting. Hightower to his credit suspected backside after TE moved left post snap changing the strength to left side. That was why he was waiting. He isn't an idiot. But at that point it shouldn't have mattered because Leno had the angle and it is a relatively easy seal block if you are taking right steps. But Leno took a hard reach step on the 3 tech just like he would if he was trying to block a strongside IZ. But it wasn't strongside IZ. With Sims pulling strength was shifted to Leno. Leno's mistake forced Kush off the 3 onto Hightower, its possible Kush screwed up too, but Leno may have forced him off and he had no choice. Also because Leno was trying to reach the 3 it made it easy for 3 to get off and make the play. Also made Kush's block 10x harder because he doesn't have angle on Hightower for a backside play. Leno f'd up what should have been a huge gain by blowing his assignment. Unless he was told to block it that way in which case it is coaching error on the line call. I dont know how Bears call plays, but a lot of play calls tell each position group their assignment. So they listen only for their part. Leno may have heard the call for IZ right and just blocked it accordingly. That is coaching mistake or design f up. You need to adjust your blocking when combining with a trap or wham block to get a seal betweent the trap and next defender. You cant just regular playside zone it. You combine a hard double at point of attack with a trap. How did ou draw lines? My gamepass didnt give me those tools? They used to have them a few years ao and now they don't. Did you take pic and use a dif program? The level of work you guys are putting in to these breakdowns is really appreciated. Excellent work! How does this effect our draft? I always felt we would go with a OL in the 3rd of 4th round, but with this signing perhaps Pace wants to go BPA. I still think an interior player will be high on the list...time to move on from Long IMO. Massie is a solid player at a position with a lot of scarcity. Keeping him first among our impending FA was the right priority IMO. Speculation has been (justifiably) all over about Long’s future especially tied to that of Whitehair. There aren’t a ton of turn key options to adequately replace Long for 2019 either, and because of that I wonder if we don’t keep him as is for 2019 (ideally with a reduced cap number but even if not) and then hold off until next year to extend Whitehair. We could potentially franchise tag Whitehair next season to ensure he doesn’t leave if it comes to that while moving on from Long then after developing his replacement for a year before putting them in the starting lineup. We don’t have any other potential franchise tag players for next year and presumably we’d be moving on from the big money allocated to Long and likely Prince then. We could also look to keep Long for 2019 and plan on using one of our two 2nd rounders in 2020 on his replacement. There are a lot of options available to us here. I say OLB then RB then SS then OG, but that's assuming Amos isn't brought back. @dll2000 Yeah I see what your saying and you make some good points. I do think it was mixture of both play-calling and lack of execution that failed on that play IMO - (I agree about Leno and Kush no matter what the initial play direction called for) . Yeah it's not a built-in feature (unfortunately they used to have alot more options than they do now like single player focus). but yeah, I just took a screen shot(print-screen) and used windows paint to quickly edit it. I'm guessing you are using a mac? If so, you can do the same using the command+Shift+3 (or 4) to save it your clipboard and then paste it into any editor you choose to make the changes you want. IMO, I don't think you can (fairly) put it all on Heistand because teaching/training will only go so far. It's on the players themselves as well. I think most of us knew coming into the season that Leno was decent but also replaceable. The physical tools and skills will only get so far, they have to also match what's upstairs. Heistand has done a good job with this group in fixing, or at least hiding some of their deficiencies (botched snaps from Whitehair) while also helping them progressively get better in certain areas. That said, there is definitely still room for improvement. But I'm also not sure how much of it is Nagy's play-calling or Heistand blocking scheme. Personally, I've come to the conclusion that it's very possible this might be a case of two different styles clashing with one another. This move follows Pace's typical strategy of eliminating needs during the free agent period so he can use the draft to pick the best talent. Thanks! Just got a Mac. Never used one before. I don’t know any of tricks.